It's likely you want an Apple Watch. According to a recent Reuters/Ipsos poll, about 15 million Americans plan to buy one. While you bide your time, so to speak—appointments are required just to demo the watch—it is well to consider that alternatives preexisted the Apple phenomenon, Samsung is preparing its (gasp!) round-faced rival and luxury watchmakers like TAG Heuer plan their own smartwatches. The Apple Watch is trumpeted as a category-defining product, and in many ways it is, but for features as simple as calculating the distance you've walked, Apple's watch will need a smartphone's wireless tech. In this sense, the Apple Watch is the ultimate iPhone accessory—except it costs much more than the device it supplements. 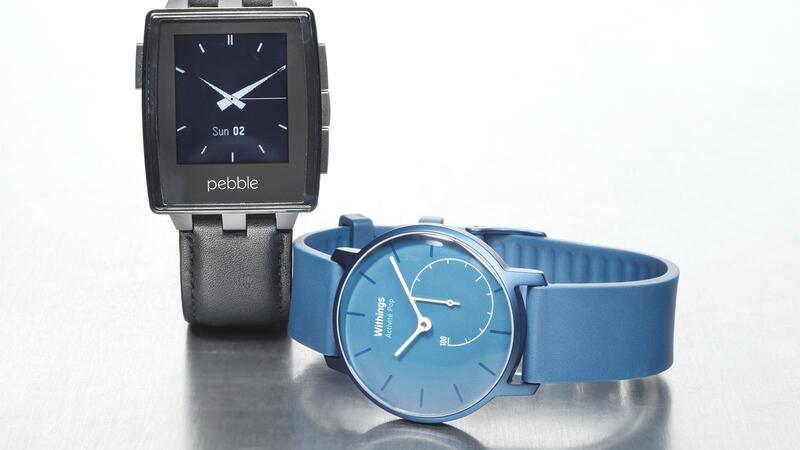 One alternative, Pebble, also imagines the smartwatch as partner to a smartphone, but this example, initially financed through Kickstarter, works with either Apple or Android. It's svelte upgrade, the Pebble Steel, boasts an attractive price point (a couple hundred dollars) and rugged stainless steel body, and in many ways, compares nicely with the Apple Watch. Pebble provides notifications, custom faces and a bustling marketplace of apps ranging from Foursquare to Connect Four. The drawback: lacking Apple Watch's memory, Pebble allows you to load only eight apps at a time from your Pebble Locker. While the screen is just smaller than that of the Apple Watch, Pebble's e-Ink technology, the same tech found in Amazon's Kindle, lends text a blocky quality, even if it is wonderfully legible in daylight. You know what's even more legible in daylight? An analog watch. Withings takes a different tack, wedding fitness tracker with traditional wristwatch. While it lacks the features of smartwatches from Apple and Pebble, Withings will sync sleep, steps and even swimming laps—it's water resistant to five atmospheres (50 meters)—with Apple or Android smartphones. Withings offers two fitness-tracking timekeepers: the $150 Pop comes with a silicon strap in a trio of colors; for threefold the cost, the Activité earns its accute accent and prix élevé with Parisian design, barenia calf leather, and a sapphire crystal face. Neither watch will draw attention to itself for the wrong reasons. Should you want to change an alarm, review fitness or add blood pressure, you'll use the Health Mate app. You can even measure heart rate by placing a finger on your smartphone's camera. The benefit of doing less is that both timekeepers achieve more battery life. Where the Apple Watch clocks about a day per charge, Pebble lasts up to a week. Withings won't need another button-cell battery for eight months. That's time well-earned, and from a timekeeper you can buy today.